Born: April 3, 1826, near Carlisle, Pennsylvania. Married: Mary Dillon Jones June 11, 1854. Died: March 29, 1900. Cyrus Kurtz Holliday was born April 3, 1826, near Carlisle, Pennsylvania, to David and Mary (Kennedy) Holliday. 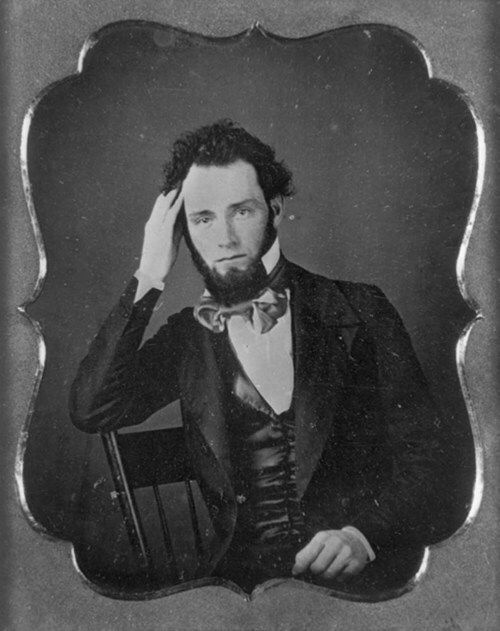 He attended public school and Allegheny College, in Meadville, graduating in 1852. He planned to practice law, but soon entered into a variety of business enterprises including a short line railroad venture. Holliday married Mary Dillon Jones in June 11, 1854, in Meadville. They had two children. Holliday settled in Lawrence in October 1854. Convinced that the territory would enter the Union as a free state, he established a new free-state settlement farther west on the Kansas River. The Topeka Town Association was formed in late December 1854 and Holliday was elected its first and only president. The honorary, though unofficial, title of colonel was bestowed on Holliday when he supervised a free-state regiment during the Wakarusa War of 1855. He would carry the unofficial title for the remainder of his life. During the Civil War, Holliday served as the adjutant general of Kansas, in which capacity he recruited soldiers and insured that supplies were sent to the front. Holliday played a principal role in founding the Free State Party. That year he was also elected to the first of many terms as mayor of Topeka. Holliday also helped found the Kansas Republican Party and served in both the territorial and state legislatures. On February 7, 1862, he donated 20 acres for the new state capitol building. Holliday was also president of the Excelsior Coke and Gas Company and Merchants National Bank of Topeka. In 1859 Holliday wrote the charter for a new railroad that would run from Atchison, Kansas, southwest along the Santa Fe Trail. He wrote and secured passage of a bill through the territorial legislature for the railroad. By 1863 Holliday secured congressionally authorized land grants, and broke ground in 1868. The Atchison, Topeka & Santa Fe Railway became Holliday's most notable business venture. He served as president of the Kansas Historical Society in 1891. Holliday served as director of the Santa Fe Railway until his death March 29, 1900, in Topeka. View primary sources related to Cyrus K. Holliday in Kansas Memory.